We were taken by boat back to La Pavona then on to Guapiles for lunch at Suerre (same place as we had breakfast on the way in) and finally Arenal (the town at the base of the volcano is La Fortuna). 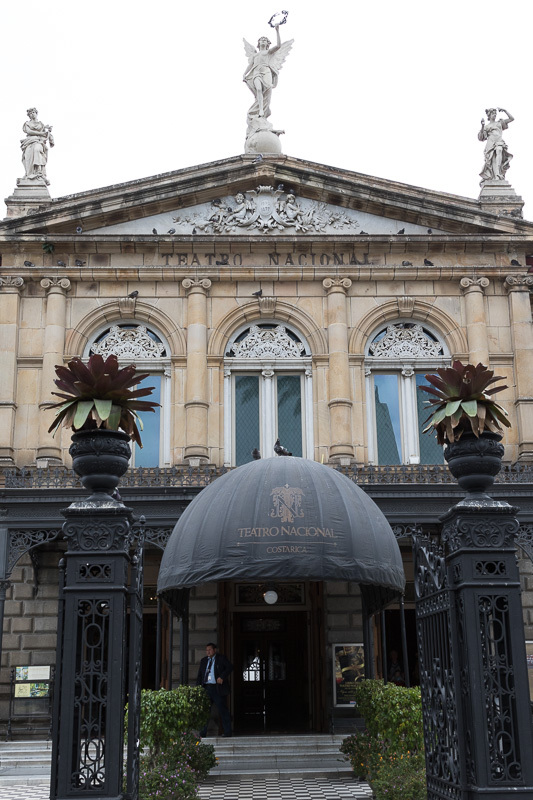 We stayed at the Tabacon Grand Spa and Thermal Resort. The suite we had was the most grand hotel room I have ever stayed in. It was larger than many of the apartments I have lived in. The key thing here is the Arenal Volcano that erupted in 1968 after a long period of dormancy. It has been dormant again since 2010. And for this hotel specifically the attraction is the thermal springs. The thermal springs were a short walk or curtesy car ride from the hotel. It was amusing to see people walking down the street in their bathrobes. We chose to do a canopy walk on the 23rd with Sky Adventures which was not part of our tour package. This turned out to be with a group and we went up and down for 4 hours. After 3.5 hours I had had it and pretty much would go a short way then have to stop and rest before repeating. Was somewhat surprised we did not see more wildlife on the walk. I probably would have been much happier doing a much shorter walk at a slower pace looking for things to photograph. I also was not that impressed with viewing the canopy. Not all that much to see except the tops of trees. I must admit I have acrophobia and did not linger on the walkways but no one else seemed to spot anything. In the afternoon we did a walk up a trail near the Arenal Volcano. We had our own guide who was made aware of my morning struggles so he was very conscious of not having me overdo it. We actually saw more wildlife than on the morning walk so I was much happier. We did tour the spa area which was very large with numerous pools. But we are not really pool people so I just put my feet in. There were just too many other things to see. 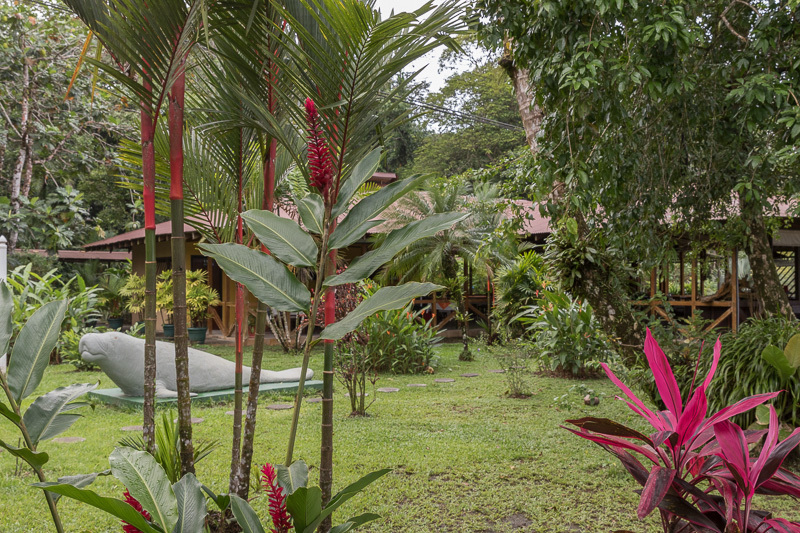 Over the next several weeks I will blog about the specific places we visited during our trip to Costa Rica. But I would like to start with some general comments. We did an individually planned tour. Thus we had drivers meet us and transfer us to the various locations. This was done through our travel agent (A & S Signature Journeys) who we had used for a number of other trips we had enjoyed. Getting out of passport control in San Jose, Costa Rica took us an hour. A number of international flights had landed at about the same time. English is widely spoken and at the hotels and on the various tours it was 100%. I could understand some of the Spanish. It was not as fast as when it is spoken among my Spanish speaking friends and it seemed clearer. Although the Colon is the official currency American dollars are widely accepted and prices are often quoted in both currencies. I was told that the exchange rate they give you when they charge you in dollars is not as great as when you charge in Colons and have your bank do the conversion. I would really suggest bringing American dollars for various tips. Just much easier. In the Eastern part of the country it rains. 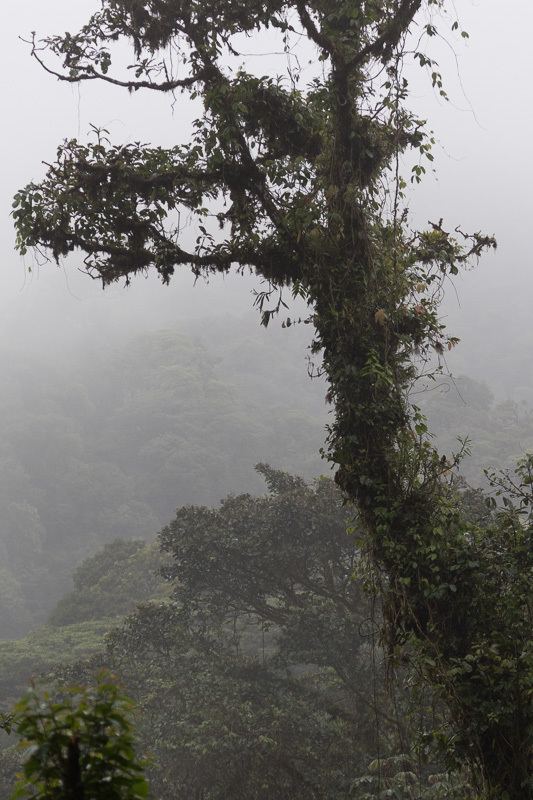 – this was the dry season in the Western part Much of the area we were in was rain forest. Since it is not cold (temperature in the 70s) it just requires some cover. But if you are out and about you can get rained on. The food we had was very good and not “exotic.” Breakfast always had gallo pinto (rice and beans - quite good), fried plantain (loved it), fresh fruits, etc. We did have casada for lunch a couple of times – rice, beans, fried plantain, salad and some protein or vegetarian. Quite frankly dinners would be familiar to any person from the United States. A frequent condiment was Salsa Lizano – hard to describe its flavor but have used it with fish since we returned. Had heard bad things about the traffic and roads. Did not find the traffic different from here. Most of the roads were fine with one lane in each direction. The road to La Pavona where you transfer to a boat for transfer to Tortuguero was badly rutted. Also the roads to Monteverde were unpaved. Really a surprise to find the roads to a major tourist location unpaved in this day and age. Many of the roads in Monteverde were paved. 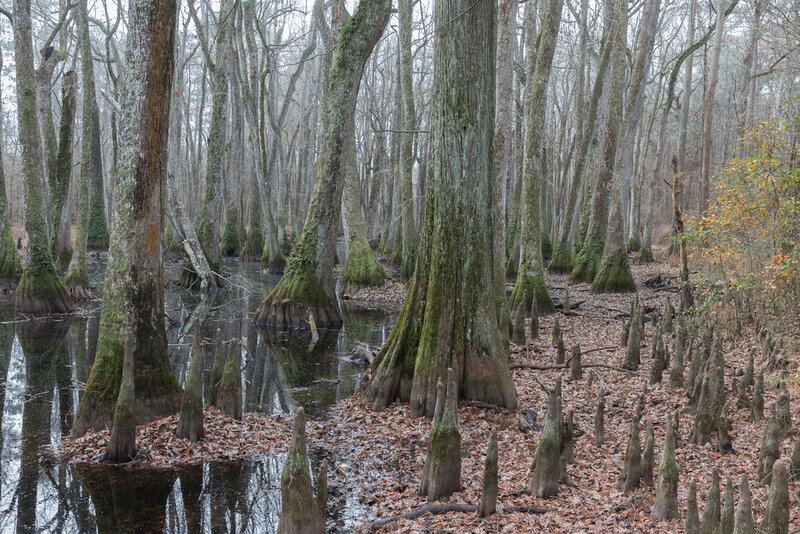 Our first stop on our last day on the Trace was Cyprus Swamp. It was a quiet and pretty solitary walk since not many others seemed to be on the Trace at this time. You really got a feel for how narrow the Trace was at this location. You could see how they left remnants for the people to view but the areas around it were valuable farm land and had been turned to that use. One of the sites we wanted to visit were the Windsor ruins so we got off at the Port Gibson exit. However, the way to the ruins was not clearly marked. We did try to stop for lunch in Port Gibson but could not find a restaurant in the city. We did find a small grocery store where we got some things to eat so all was not lost. We did try to get to the Windsor ruins later in the day by another rout but it turns out after almost 15 miles the road was under construction and closed. We made a stop at Mount Locust where they had a building that had served as a road house when the Trace was active. In this day of interstate freeways it is hard to imagine that making 20 miles in a day was typical. Finally arriving in Natchez we had completed our 444 mile journey. Natchez has preserved a lot of their historic buildings. Along the Mississippi it has a pretty location. Our journey home was leisurely – at least until we were 20 miles South of Champaign Illinois. Then we came into snow and it continued the rest of the way into Chicago. For almost 2 years now I have had a small SUV with 4-wheel drive. It does a good job in the snow. Saw a number of cars that had gone off the road. For the 23 years before this SUV I had sports cars. In the snow they were downright dangerous. That is what made me turn to the SUV. I could not take the anxiety of driving in the snow in those cars. On our second day on the Trace we set foot into the two states I had yet to visit – Alabama and Mississippi. This was something I had thought about doing for some time now – especially when I was down to just a handful of states. Shortly after passing into Alabama we stopped at Rock Spring. This has a short walk past several beaver mounds on the river. It was such a peaceful area. Our first stop in Mississippi was at Bear Creek Mound. This was the first of several mound sites along the Trace we would stop at. The pictures do not do justice to the effort that must have gone into their construction. The piles of dirt were carried by hand – the wheel and beasts of burden were not available in this area at the time they were built. Imagine the effort to organize the people to work for this abstract goal. For lunch this day we went to the town of Baldwin. Again limited choices while on the Trace. This restaurant had two items on the menu – fried chicken and hamburger steak. Salad was an item on another day. As an omnivore it is easy for me but in these small towns if you have any restrictions there could be a problem. For the evening we stopped in the town of Kosciuska. Basically they had two motels – it has been a long time since I had a room for the evening that cost less than $70. Not much choice for food either. Our first night of the journey we stopped just south of Louisville, Kentucky. One of the problems stopping outside of towns is the lack of dining options. In this case the “best” option was the Waffle House. My first time at one of these fine establishments and if I have my way it will be my last time - at least for dinner. Driving through Nashville, Tennessee to enter the Natchez Trace had us driving down the street (West End) I used to take to get to work when I lived in Nashville. Some of it looked the same, some different. The different is probably more to be expected – we lived there 42 years ago! The entrance to the Trace is in the town of Pasquo. I should have realized it at this point but I did not – the signage for the entrance is not that prominent. In the future I would use Google Maps to make sure I know what the entrance will look like. I had made a list of the 20 sites recommended by our tour book. There are certainly a large number of marked sites but if one were to stop at all of them it would take much longer. The first of the sites on my list was at mile 438 – the double arch bridge. We really did not get the view in the tour books – I am not sure where the road to the view was. Being a creature of habit by 11:30 I was looking for a place for lunch. It was obvious that all services would require leaving the Trace. We ate lunch is a really small town called Leipers Fork at a restaurant called Country Boy. It was very obvious that many in this small restaurant were regulars. It was also obvious we were in the South because sweet tea was available. After lunch we made stops at Gordon House and ferry site, Jackson Falls, and the Meriwether Lewis memorial. It is really remarkable to me that Lewis and Clark led a group of men on this great trek to the Pacific Ocean in 1804-1806. Going into a great unknown like that seems to me to require a really special person. Reading about the life of Lewis after this is kind of sad even to what may have been his eventual suicide in 1809. On trips like this I like to stop before it gets dark. So we decided to spend the evening in Florence, Alabama. This town is actually a distance from the Trace but it did get me into Alabama for the evening. I just accomplished one of the travel goals I have had for a while – visit all 50 states. Between December 18 and 24 of 2017 I finally visited the last two – Alabama and Mississippi. We traveled the Natchez Trace Parkway from Nashville Tennessee to Natchez Misssissippi. This 444 mile route also takes one through the north-west corner of Alabama. At the time of year we did this trip it was definitely the off season. The traffic was very light and most often we were the only person at each of the stops. I think this goal to visit all 50 states was set when I started traveling to other countries. I read or heard someone criticize travelers for visiting foreign countries without visiting their own country. When I thought about the states I had visited already at that point it was quite a few. This was helped by the fact that I had lived in 6 states. Then I was able to visit a lot of other states by road tripping to one of the professional meetings I attended semi regularly. They were held at that time on college campuses throughout the country. One of the things that surprised me on this trip was that my cars GPS points of interest feature was in error at times. The second day of the trip we were going to stay in Florence Alabama. The GPS listed a Marriott but there was no hotel at the location. Fortunately there were other hotels a couple of miles away. Another time it was getting time for lunch so we looked at the GPS and it said a place was available in Port Gibson Mississippi. The restaurant was closed and when we looked for other recommendations the second one was nonexistent and even the grocery store we decided to get food at was not there. Nowadays of course you could choose to look up these things on your phone but in some of the areas we were in cell phone service was nonexistent. I admit I am a candy lover. I recommend you get a bag of Pascall Airplanes. They are really good. I tried a number of other varieties from the company and did like the gummy worms. But the airplanes are the best. It was clearly posted that there was a 7 kg limit for carry-ons for the plane and they even came on the speakers and made the announcement. I know my camera equipment was more than that and it made me very nervous. I took out one of my lenses and put it in my jacket pocket and put the camera and another lens around my neck. Turns out they did not weight anyones luggage as far as I could tell but there was a scale at the boarding desk. One of the things that surprised me is that screens were not on the windows or doors at any of the places we stayed. From the nature of the places it seemed that this could be generalized to say that the norm is no screens. They do have flies and I am sure they have mosquitoes. I know in my house I would not open the windows and remove the screens. When we have had the screens off in earlier homes surprising things have made their way inside. Not my favorite thing. A pleasant surprise was the quality of the public restrooms. When one is out for the day it is not unusual to have a need for a restroom. In America this usually means finding a gas station or fast food restaurant and using their facilities. Now these exist in New Zealand but they also have very nice public restrooms. They also have signs indicating the presence of restrooms off the major roads. I have been a coffee drinker since high school. I enjoy a cup of coffee after a meal. I find a cup of coffee relaxing and it certainly does not interfere with my sleep. Turns out New Zealand has what they call a long black. It is two shots of expresso with some hot water to make a cup. A flat white has an additional bit of milk. This is made to order so it takes a bit – not like a premade pot of coffee here in America. This can be found pretty much anyplace. We were at several Sunday farmers markets and a number of booths were set up with their expresso makers. They use credit cards (with the chip) EVERYWHERE and for EVERYTHING. I am still used to paying for small purchases with cash. In New Zealand people pay for a cup of coffee with their credit card. In fact I saw cash being used only rarely. As always when you travel out of your usual area make sure you let your credit card company know – the last thing you want is to have you card blocked when you are out of the country. The drive to Queenstown from Christchurch is long but does pass through beautiful scenery. The town of Queenstown in in a beautiful setting on Lake Wakatipu. 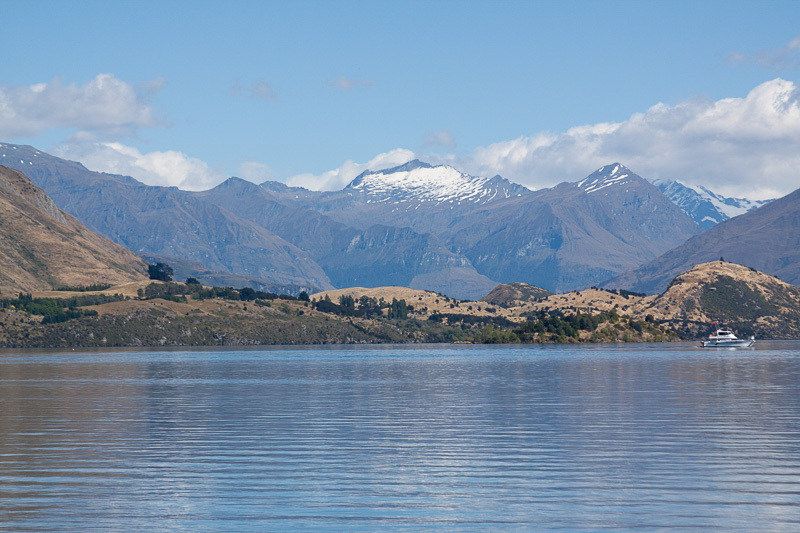 Queenstown does have a reputation as an adventure city and one can find plenty of offers for various excursions. As one might expect this also draws many backpackers and the downtown area has hostels and places to eat one would expect. One beautiful drive from Queenstown is to Glenorchy. The road hugs the mountain which goes right into Lake Wakatipu. Unfortunately the weather was not super cooperative as we had rain for much of the day but really enjoyed what we were able to see. Another beautiful drive we took is to Wanaka via Cardrona. We continued on 6 up past Lake Hawea to the Blue Pool trail. There we found a nice hiking trail up to what were supposed to be blue pools. We were told the recent rains had spoiled the effect. We also ventured to Arrowtown which is quite close. It has an area devoted to the Chinese who came for the gold rush. The drive from Hokitika to Christchurch takes you through Arthur’s Pass. This is another beautiful drive. The road however had suffered a slide the previous week and was only open for 10 minutes at the top of each hour. As luck would have it we just missed the open period so had to wait 50 minutes for the next opening. I cannot think of a place in America where if a major road were closed for 50 minutes you would not have a huge backup of very angry drivers. Here it was very pleasant with people getting out of their cars and talking and nowhere near as many cars as one might have anticipated. Christchurch is another city which has hit hard by recent earthquakes. In this case in 2010 and 2011 major earthquakes damaged many buildings. You can still see buildings partially destroyed. Driving downtown is a challenge because of all the detours. We did take a gondola to get views of the city and surrounding area. You could even do walks from there. Another excursion was to the botanical garden. It was quite busy and had very nice flowers but I have been spoiled by the Chicago Botanical Garden which is much nicer. We took our time going from Picton to Hokitika – 12 hours in all. We went west to the town of Westport before heading down the coast along the Tasman Sea. We stopped at Cape Foulwind and in Punakaiki for the Pancake Rocks. Both are nice stopping places and the walks broke up the car ride. We had originally intended to go to Kaikoura on the east coast but a magnitude 7.8 earthquake on November 14, 2016 forced us to change our plans. Even when we were in New Zealand at the end of January the roads leading into Kaikoura from the north and south were still a problem and people were asked not to head there unless necessary. Hokitika does not have all that much going on. One interesting aspect was the house we were renting required that we take the trash to the city dump before leaving. It is, however, a convenient jumping off point for the Franz Joseph Glacier. Although I can see how the hike to the glacier would be very pretty with all kinds of waterfalls around when we were there it was raining lightly and a little on the chilly side. We did the walk to the glacier but did not linger as we were cold and drenched. To get to the South Island we took the ferry which runs from Wellington to Picton. We returned our car at the ferry terminal in Wellington. Although you can take cars on the ferry the rental companies do not wish you to do so. To me it was odd in that you park your car in a certain area of the lot and drop you keys in a return box. I felt some degree of anxiety about the car company saying there were issues with the car but it works out fine. On the other end in Picton the car rental agencies are right outside the terminal doors. The ferry terminal in Wellington is not near anything of interest so once you are there you are stuck. They did have a little snack counter but not much else. The ferry ride was nice and smooth. I stayed on deck most of the time to catch the views and to take pictures. We had opted for the upgrade and so had plush seats. The upgrade also includes food and drinks. Since I do not drink all that much and did not wish to drink that early in the day we did not eat and drink the extra cost. On the drive from Napier to Martinborough (about 1 h 13 minutes from Wellington) we stopped at the Pukaha Mount Bruce National Wildlife Center. A big part of their effort is conservation and working on preserving the native wildlife. Like many other places the introduction of mice, rats and other mammals has devastated the native birds. In a number of large enclosures they had native endangered birds. In Martinborough we stayed in a house made of straw bales. At least according to the literature these can last if made correctly (preventing moisture). Martinborough is an interesting town. It has a resident population of 1600. In the town center are a surprising number of very nice restaurants. This whole area is wine country and a number of vineyards are here. The drive from Martinborough to Wellington is 81 km over a very twisty mountain road. Takes a degree of concentration with all the turns on the narrow lanes. One day we could not go into Wellington because the winds made the driving treacherous winds of over 60 mph. Wellington is the capital of New Zealand and sits on the Cook Strait. The area is known for its strong winds. Our first adventure into Wellington the weather was not great so we went to the Museum of New Zealand rather than the botanical garden. Although I would rather be seeing the city than a museum this was a fine alternative. A lot about the history of course. I can not imagine the first people arriving here over 800 years ago. It would have require long travels over open ocean. I mean how long do you travel without seeing anything before turning around and if you do turn around how do you find you way back. After the museum we went to Mount Victoria Lookout. This offers very scenic views of the city. On another excursion to Wellington we traveled along the ocean to Te Kopahu Visitor Center. At the end of the road you can walk along the beach which made for a nice day. Another excursion was to Cape Palliser on the South-East coast of the North Island. This is a scenic drive and not widely taken. I should mention that the last part of the drive is over gravel roads. Just have to take it slow. At the end there is a lighthouse – it is over 250 steps to the lighthouse. With the wind and my fear of heights I only made it half way. On the way back to Martinborough we stopped at Lake Ferry for lunch. The Lake Ferry Hotel is noted for their fish and chips so we ate there. A quite nice beach area is there with various birds and fur seals making for a very pleasant and restful time. Napier is about a 3 hour drive from Rotorua on the east coast of New Zealand in the Hawke’s Bay region. This is where we learned the lesson about getting gas again. On the drive, the region from Taupo towards Napier has NO gas stations (about 90 miles). Even the gas stations in Taupo are not so obvious. We actually back tracked to Taupo to get gas because we were unsure if we had enough. And if you do run into problems you cannot even call because there is no cell service. Napier was destroyed by an earthquake on February 3, 1931. It was rebuilt in the Art Deco style of the time and that is the big attraction of the downtown area of the city. It is also noted at a wine area.